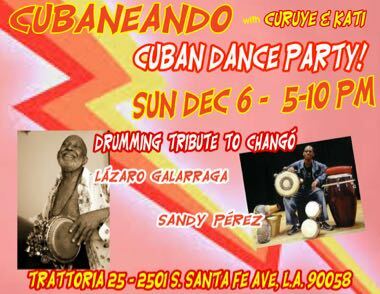 DRUMMING TRIBUTE to CHANGÓ & CUBAN DANCE PARTY at CUBANEANDO in L.A.
CUBANEANDO in L.A. with CURUYE & KATI HERNÁNDEZ presents a special CUBAN DANCE PARTY that will include a DRUMMING TRIBUTE to CHANGÓ, powerful deity of the drum, dancer par excellence, in Cuba’s Yoruba tradition whose day is celebrated this week! Featured will be master percussionists LÁZARO GALARRAGA (Conjunto Folklórico Nacional de Cuba), and coming down from the Bay, SANDY PÉREZ (Afro Cuba de Matanzas)! There also will be plenty of CUBAN SON, TIMBA, REGGAETÓN, & RUMBA to keep you on the dance floor during the evening! DEEJAY WARAPO will be on hand on his birthday eve to maintain the energy! We’ll be celebrating the December birthdays of BRIAN ROSENBAUM, CHIQUITA FLOWERS, LARRY THOMAS, WILLA STEVENSON, DEEJAY WARAPO (so far! ), and ZEAL HARRIS' SEND OFF for her CARIBBEAN RESEARCH PROJECT at this year-end dance party! KATI will start the evening off with an AFRO TIMBA dance class dedicated to CHANGÓ. Consider wearing CHANGÓ's COLORS tonight: RED & WHITE! TRATTORIA 25 is located in the Santa Fe Plaza on the corner of 25th & Santa Fe, L.A. 90058. Free parking behind the restaurant! $12 cover includes Kati's dance class. 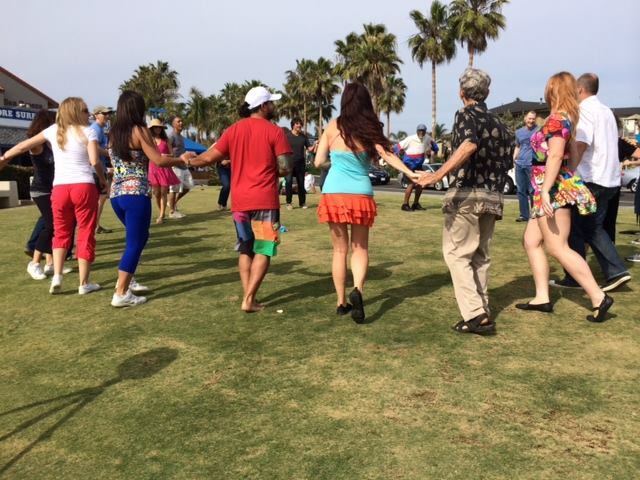 Burn some calories after Thanksgiving by dancing it off with rueda de casino outside in front of the gorgeous beach-view in Carlsbad. Trying out a new spot for the Casino on Concrete series, but we will be on the grass. Same place where we had the very first San Diego Rueda Flash Mob which took place two years ago. The picture below is where it will be. COST: Just bring a snack to share. Layer up as it could get cold. If you dance though, you'll be taking off the layers. Beginners Cuban Salsa class has a new structure now. It will be a casino footwork/partner work class. 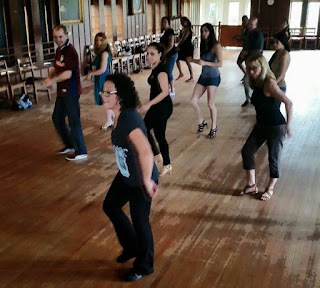 There may be some time for rueda at the end of the class, but the idea is to dance one-on-one to achieve technique. I will have the list of the 9 basic moves on the wall and use video recordings of you to assess and offer feedback. 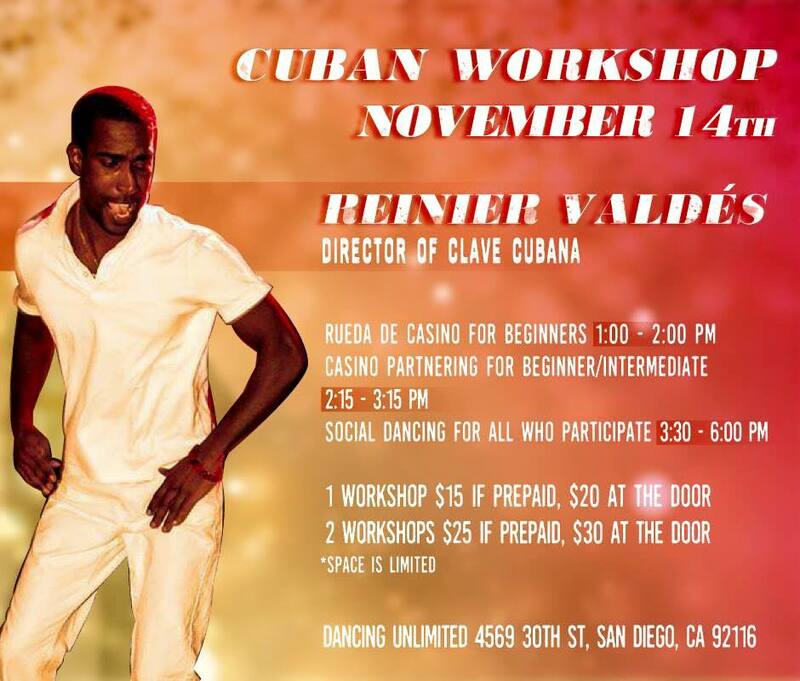 Each session will be focused on 1 to 3 of the moves listed below until it can be done with 1-hand connection, 2-hand connection, no-hand connection, finding the beat, effective dance communication for both lead and follow and arriving in the right positioning for casino and rueda de casino. If I see you have mastered all the 9 moves listed below, have found the beat, mastered good dance communication with your partner, I will invite you to the intermediate level class. There will be no announcement about it on the Dancessense Studios webpage as I am only renting the space for a specialized level of casino/rueda. If you have done casino/rueda before but you are rusty, please do not enter the intermediate level until I have given you the green light to enter. If I see you struggling in the intermediate level class, I will kindly ask you to step out of the rueda and sit it out and will provide you feedback what you need to improve on. I may ask you to return to the beginners rueda class. My rationale for this strict rule is to improve the transition from beginner to intermediate level of casino. Plus, it disrespects the intermediate level casino dancer who paid me a fee to be challenged. My hope is that we as a San Diego Casino dance community can truly improve our technique with casino. Contact information is listed on the Dance Instructor's Tab of this blog. 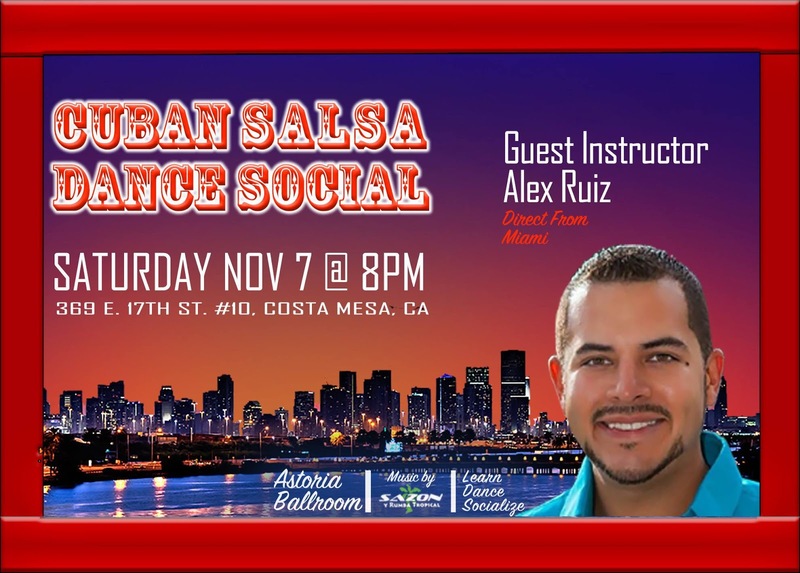 Come join us at the beautiful Astoria Ballroom in Costa Mesa for a Cuban Salsa class with Alex Ruiz followed by a night of social dancing. Alex is new to the LA & OC scene and bringing nearly 20 years of dance instruction direct from Miami. Come check out the elegant Astoria Ballroom and enjoy free convenient parking, a large wooden dance floor, air conditioning, a kitchen and cozy seating area. Feel free to bring your own drinks and snacks to enjoy during the social. DJ Sazon will be playing your favorite Timba music for ruedas and casino style dancing. Other crowd pleasing requests (i.e. salsa, bachata, kizomba, zouk, etc.) may also be played.